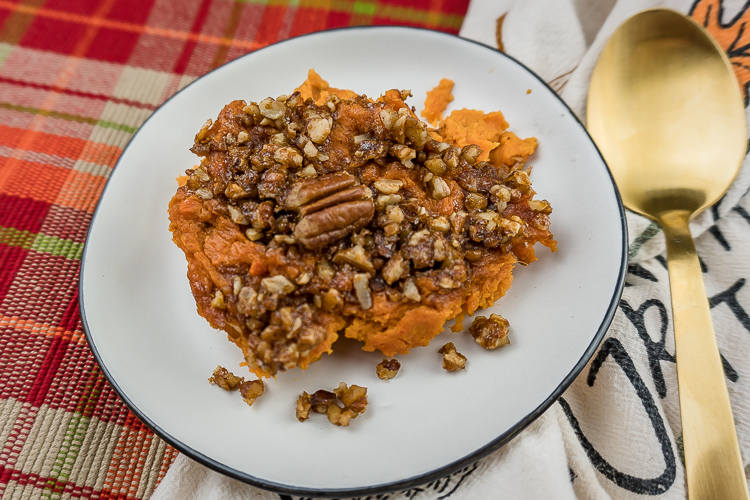 This is a super yummy and easy sweet potato casserole recipe! It contains no refined sugar and can easily be made dairy free if you substitute the butter for coconut oil. 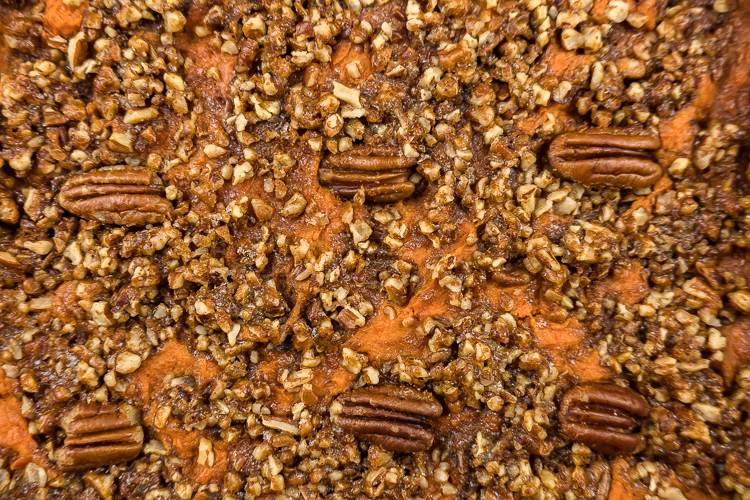 It harkens back to a traditional sweet potato casserole but with a few alterations and without the marshmallows. Some traditional casseroles include flour in the topping, but not mine, so this is gluten free too! 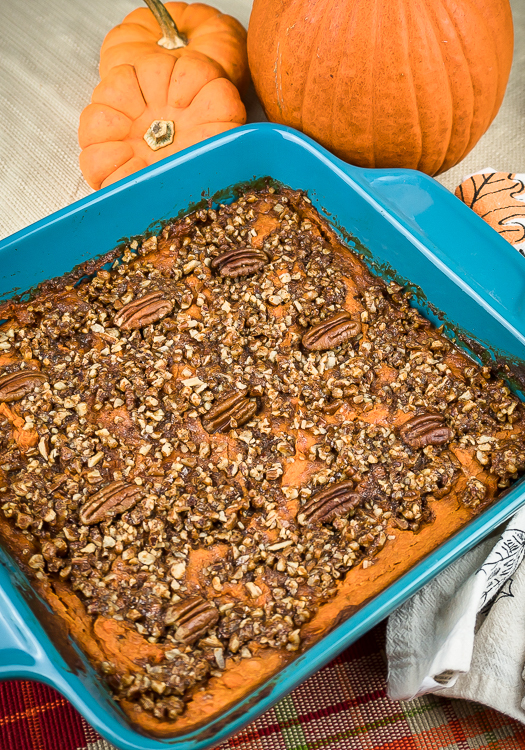 This recipe is allergy friendly and perfect to bring to family gatherings! I really like to use coconut sugar in place of refined sugar. It has a slight brown sugar taste (doesn’t taste like coconut at all!) and doesn’t affect your blood sugar like refined sugar does. It’s still sugar but a better alternative. Thanksgiving is such a wonderful time! I love getting to be around family and this year I get to experience Thanksgiving with my husband’s side of the family. They have a tradition of always eating shrimp cocktail at the start of the meal. My family has certain food we eat too- like my mom’s cranberry sauce and her delicious deviled eggs. With both sides of the family I always look forward to trying new dishes. This year my dad is smoking the turkey! Talk about a turkey like I’ve never had! 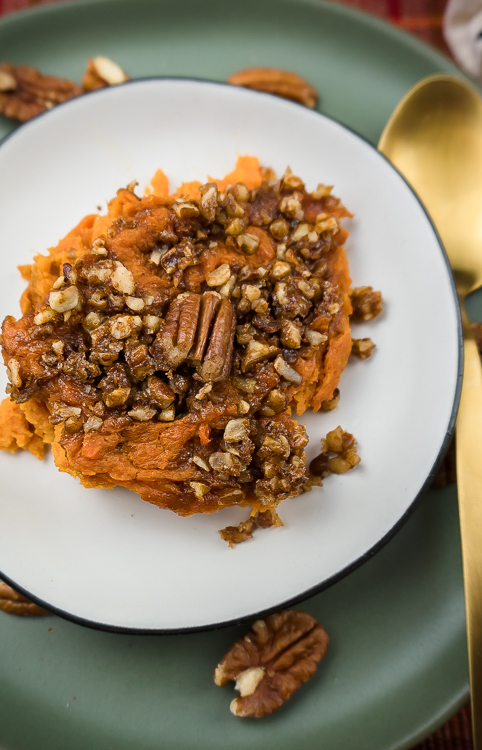 Anyways, this healthy sweet potato casserole fits the new dish category for me! Both my husband and I really enjoy the creamy texture and the delicious sweet potato flavor! Scrumptious for sure! What types of dishes are family traditions for you? Let me know in a comment below! 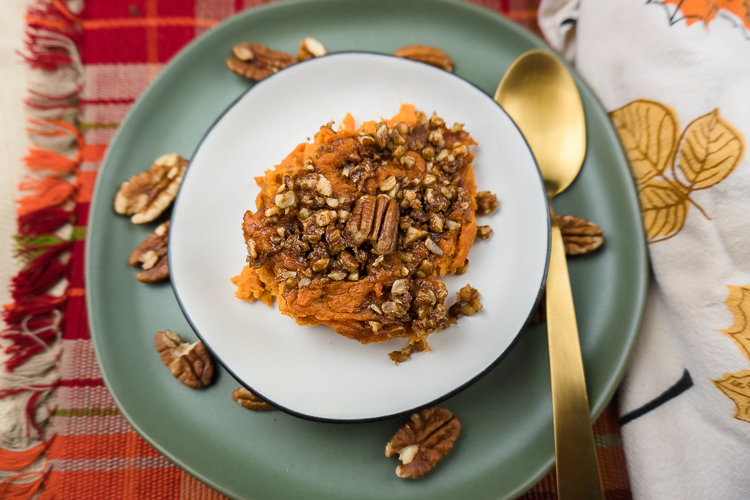 With Thanksgiving right around the corner this is a perfect time to whip up this simple sweet potato casserole! Take it to a potluck or make it for your own family gathering! And this delicious cranberry relish! Oh and this yummy Pumpkin Ricotta Cheesecake! 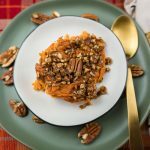 A delicious and simple sweet potato casserole perfect for Thanksgiving or any meal! Preheat oven to 350°. Use a fork to poke holes in the sweet potatoes. You many need a few medium-large sweet potatoes to make 4 cups. After putting holes in the sweet potatoes lay them on a foil lined baking sheet and bake for about an hour. Remove from oven when they are cooked all the way through. Cream coconut sugar and butter until well combined. Beat in eggs one at a time until fully incorporated. Beat in the vanilla, cinnamon, salt, coconut cream and mashed sweet potato. Put filling in a greased and 8x8 casserole dish. Bake 25 minutes at 350°. 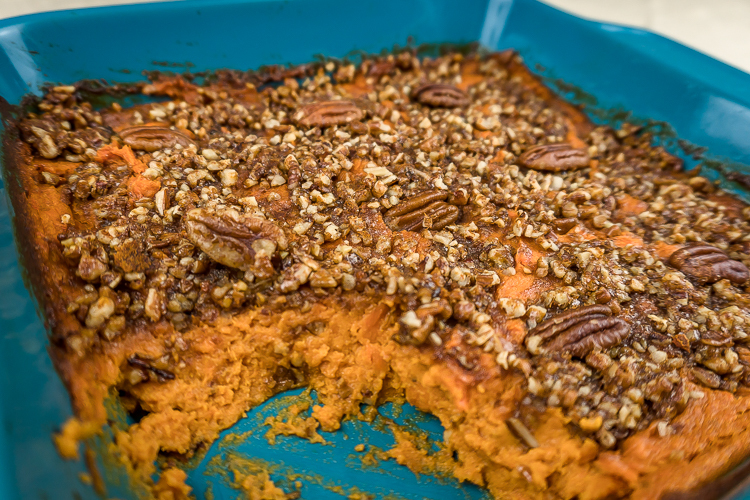 While the sweet potato is in the oven mix together the topping ingredients. After 25 minutes of baking, add the topping to the casserole and bake for an additional 10 minutes or until warmed through. Enjoy!